Nobody likes Cockroaches. These unwanted pests contaminate our food, invade our homes and spread disease. But what do we really know about them? Here are some interesting facts about Cockroaches. Cockroaches and termites are actually related. They are both from the insect order Blattodea, with a history spanning 300 million years. It is believed that little change has occurred in their body shape during this time. With Cockroaches being such a successful species, the lack of evolution is not surprising. Cockroaches are not native to Australia, with even the Australian Cockroach being an introduced species. It is thought that most Cockroach species originated in Asia. Cockroaches are omnivorous feeders. This means that they will eat virtually any human or animal food or beverage. They also consume dead animals or vegetables including: leather, cardboard, fabrics, hair, glue, wallpaper glue in addition to starchy materials such as book bindings. Cockroaches can survive on drips of beverage on carpets, drips of fat on the kitchen floor or tiny specks of food found on the floor. These tiny spillages can be enough to feed a family of Cockroaches. Commercial kitchens can be home to hundreds or thousands of Cockroaches. 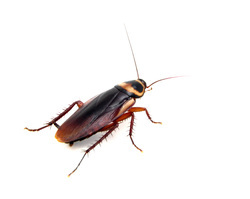 Keeping your home and kitchen as clean as possible and cleaning up any spills is essential in any Cockroach control program. Hunter United Pest Control can control your Cockroach problems and advise you on the most affective ways to reduce the risk of a Cockroach infestation.